Irish women demonstrate outside the Parliament in Dublin against Prime Minister Enda Kenny's plan to legalize abortion in Ireland. We offer this guest commentary from an advocate of the culture of life close to the ongoing fight for legalization of abortion in Ireland, one of the last two European nations, along with Malta, that protects unborn children under its laws. During the final stages of World War II in the Pacific, military aviators of the Empire of Japan adopted their famous kamikaze tactic: suicide missions in which Japanese pilots sacrificed themselves by crashing into Allied warships and other targets. The idea of engaging in a suicide mission by crashing and burning their planes was a tactic of desperation, when no better plan could be formulated to rescue Japan from its dire situation. Of course, kamikaze didn’t work. History records that over 4,000 young Japanese pilots sacrificed themselves, only 14 percent even reaching a target. Kamikaze is a good metaphor to describe the current flight plan of Fine Gael, under the leadership of Taosiech Mr. Enda Kenny. The kamikaze missions between 1944 and the surrender of Japan were utterly destructive and failed as a strategy for Japanese victory during the crisis of the war. Today, Kenny seems intent on guiding the Fine Gael plane toward political demise, even if it destroys his government and his party to do so. Fine Gael under Kenny, is currently moving fast in a downward direction. For the first time since 2008, the opposition Fianna Fáil has managed to overtake Fine Gael, and the numbers could get worse. The Irish Times states that Fianna Fáil’s support has “…almost doubled since last April.” Furthermore, the Taoiseach’s rating is at, “… its lowest...” since he became Prime Minister. And what is the Taosiech’s great big idea, at a time of unprecedented economic crisis in Ireland? Legalize abortion. There is a kamikazemission for you. Kenny explicitly promised Fine Gael’s supporters that he would not legislate for abortion, and voters remember electoral pledges. 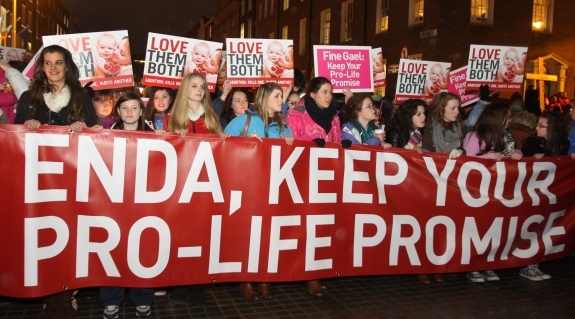 Fine Gael supporters are also one of the most prolife constituencies in Ireland. Kenny is not listening to his base on the issue of the sanctity of human life. There is mounting evidence that he is not listening to their other concerns either. The Community Foundation for Ireland’s VitalSigns2012 Community Survey, open to all citizens on the World Wide Web, shows that─out of 119 issues─eight of the top ten addressed by respondents concern education in Ireland. The great majority of the public is clearly dissatisfied with employment, housing, and health issues. Interestingly enough religious and spiritual issues were found toward the bottom of the list. But what happens when ineffective government functionaries face economic crisis and have no plan for the needed recovery? They create a new and completely unnecessary crisis to distract from the real issues. What is Enda Kenny’s brilliant solution to the problems of Ireland? To ignite a new cultural and political war by throwing the abortion issue into the center of the public arena. Legalizing abortion in Ireland may get Enda Kenny some points with the radical European elites, but as recent data shows, politics is local. This, simply put, is a political kamikaze mission. Unless wiser heads such as Lucinda Creighton and others prevail, Kenny will be causing a completely unnecessary danger to members of his party. Let all of Fin Gael’s parliamentarian consider: Violating one’s conscience for a soon-to-be-replaced leader like Enda Kenny, is sure to be a disaster in the long run. If you allow it, this man, now virtually unknown, will take his place in world history as the father of abortion in Ireland. This will be his legacy. We will remember nothing else of this man. Poor Enda Kenny is being bullied by European radical elites, the Labour Party, and the abortion lobby. This pilot is not even in control of the plane. We say to all members of political parties in Ireland who still have some humanity and solidarity with the unborn baby: Do not allow yourselves to be bullied by Enda Kenny. Get off the plane, before the crash. If enough refuse to cooperate, the kamikaze mission will fail. Dying for this clothes-less emperor is not worth your morals, your dignity as a politician, and your intellectual integrity. You were not elected to mindlessly follow Enda Kenny. You were elected carry out your duty to uphold the constitutional protection of the unborn child in Ireland. Voting to remove the protection of infants in the womb, preparing thus the road for the great evils of abortion to take hold of Ireland, is to embark on a suicidal mission. The evils abortion has unleashed medically, psychologically, morally, and spiritually upon hundreds of millions of women worldwide is scientifically verifiable. But as the tragedy of Japan’s young pilots should have taught us, a political kamikaze mission requires those in the game to ignore facts, shun reality, close their eyes, and die for the emperor. It is an irony that the press, which should keep politicians honest, chooses to ignore the lies and false promises of Enda Kenny. Instead, Ireland’s press corps chooses to attack well-respected women politicians such as Lucinda Creighton, who not only has had the courage to maintain her commitment to the constitutional duty to protect the unborn, but also is a reminder to the back benchers, that they are not expendable foot soldiers and that they should refuse to go on these diversionary, yet lethal adventures with a man as weak as Enda Kenny.